If you're looking for a great (and cheap!) hotel in Mammoth Lakes, CheapTickets is the best place to find them. We offer deals on the best 688 hotels throughout Mammoth Lakes. No matter what you're looking for, we have options for you. Grab great rates on the 421 affordable 3-star hotels that are easy on the wallet without sacrificing comfort. Looking for more luxury? Try one of the 29, 4-star hotel accommodations in Mammoth Lakes. No matter your budget needs, we've pulled out all the stops to make sure you have plenty of vacation options. Maybe you prefer to search for your hotel deals based on what each hotel offers? For example, let's say you just want to find a hotel or resort that has a pool to cool off in after a long day exploring Mammoth Lakes. Scroll down to choose from the 39 hotels in Mammoth Lakes that has a pool for guests. Or search for deals on Mammoth Lakes hotels offering free wifi or breakfast, non-smoking rooms, and more! CheapTickets is here to be your personal travel agent for your next trip to Mammoth Lakes. Get booking today! What hotels in Mammoth Lakes offer free wifi access? Are there deals on Mammoth Lakes hotels offering free breakfast? Yes! The only thing better than finding a great deal on a cheap hotel in Mammoth Lakes is finding one that offers free breakfast. Grab some eggs, a waffle, or some healthy oatmeal before a day full of exploring Mammoth Lakes and all that it has to offer. Below are just some of the many hotels that offer free breakfast in Mammoth Lakes. Best Western Plus High Sierra Hotel is a 2.50 star rated hotel property in Mammoth Lakes that offers free breakfast. 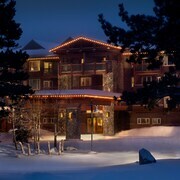 The Lodge at Sierra Nevada Resort & Spa is a 3.50 star rated hotel property in Mammoth Lakes that offers free breakfast. Cinnamon Bear Inn is a 2.50 star rated hotel property in Mammoth Lakes that offers free breakfast. The M Mammoth Motel is a 3.50 star rated hotel property in Mammoth Lakes that offers free breakfast. What about deals on pet-friendly hotels in Mammoth Lakes? Mammoth Lakes is a great place to get outside and explore with your pets in tow so don't leave your furry friends behind. Below you'll find great deals on hotels in Mammoth Lakes that allow pets. Don't forget to bring plenty of treats! 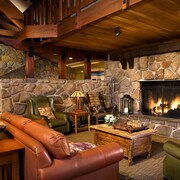 Tamarack Lodge Resort is a popular, pet-friendly, 3.00 star hotel in Mammoth Lakes. 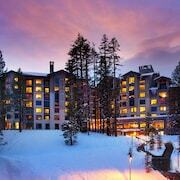 Snowcreek Resort is a popular, pet-friendly, 3.00 star hotel in Mammoth Lakes. 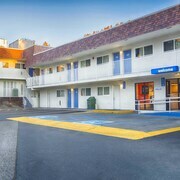 Travelodge by Wyndham Mammoth Lakes is a popular, pet-friendly, 2.00 star hotel in Mammoth Lakes. Motel 6 Mammoth Lakes is a popular, pet-friendly, 2.00 star hotel in Mammoth Lakes. Any good rates on Mammoth Lakes hotels with restaurants? Absolutely. Don't want to deal with planning our all your meals on your trip to Mammoth Lakes? We don't blame you. Keep the hangry away by staying in one of the 10 hotels that have restaurants. With a room at one of these spots, all it takes to get a good meal is hopping in the elevator. Check out some of the most popular hotels in Mammoth Lakes that have restaurants below. Book Austria Hof LodgeAustria Hof Lodge is a 3.00 star hotel and has one or more restaurant options. Book The Westin Monache Resort- MammothThe Westin Monache Resort- Mammoth is a 4.00 star hotel and has one or more restaurant options. 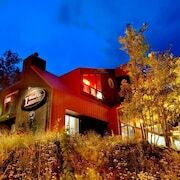 Book Mammoth Mountain InnMammoth Mountain Inn is a 3.00 star hotel and has one or more restaurant options. Book Sierra Nevada Resort & SpaSierra Nevada Resort & Spa is a 3.50 star hotel and has one or more restaurant options. What are the cheapest hotels in Mammoth Lakes with pools? What's better after a long day exploring Mammoth Lakes then a relaxing dip in a pool? Finding the Mammoth Lakes hotel you need for a bargain! Cool off and unwind at one of our 39 Mammoth Lakes hotels with a pool. Browse some of the top deals on these hotels and resorts with pools in Mammoth Lakes below, but be warned: You may not want to check out! Alpenhof Lodge has a pool and a 2.50 star rating. The Mammoth Creek Inn has a pool and a 2.50 star rating. The Village Lodge has a pool and a 3.50 star rating. Austria Hof Lodge has a pool and a 3.00 star rating. What hotels in Mammoth Lakes offer parking for guests? Once you've made your way to Mammoth Lakes, the last thing you want to deal with is finding parking close to your hotel. Avoid the hassle of parking around the block and carrying your luggage all the way to the lobby by booking one of our hotels with parking. Check out deals on some of the 46 hotels in Mammoth Lakes that offer parking for guests. Mammoth Ski & Racquet Club This hotel has a 3.00-star rating. Mountainback at Mammoth This hotel has a 3.00-star rating. 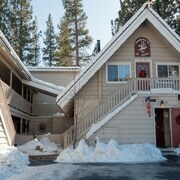 1849 Condos - Mammoth Lakes by RedAwning This hotel has a 3.50-star rating. Mammoth Mountain Inn This hotel has a 3.00-star rating. Do Mammoth Lakes hotels offer 24-hour concierge services? When you're on vacation, things don't always go according to plan. Travel with peace of mind when you book one of our 6 hotels in Mammoth Lakes with 24-hour concierge service. That way you know help is always phone call or elevator ride away. Try Juniper Springs Resort. It's a 3.50 star rated hotel in Mammoth Lakes that offers concierge services 24 hours a day. Try Sierra Nevada Resort & Spa. It's a 3.50 star rated hotel in Mammoth Lakes that offers concierge services 24 hours a day. 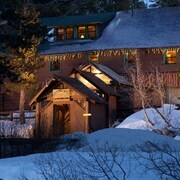 Try Mammoth Mountain Inn. It's a 3.00 star rated hotel in Mammoth Lakes that offers concierge services 24 hours a day. Try The Mammoth Creek Inn. It's a 2.50 star rated hotel in Mammoth Lakes that offers concierge services 24 hours a day. What about low rates on non-smoking hotels in Mammoth Lakes? 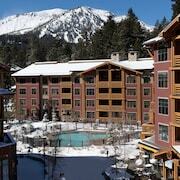 Mammoth Mountain Reservations Condo Collection This hotel has a 3.00-star rating. 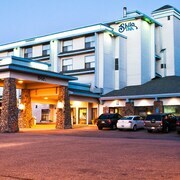 Shilo Inn Suites - Mammoth Lakes This hotel has a 2.50-star rating. What are the cheapest Mammoth Lakes 3-star hotel deals? Our 3-star hotels bring you quality accommodations at a lower price point for the perfect, budget-friendly vacation in Mammoth Lakes. With 421 3-star hotels throughout Mammoth Lakes to choose from, you still have options. Browse our selection below. Sierra Nevada Resort & Spa. This Mammoth Lakes resort runs a free shuttle service to Mammoth Mountain Ski Area, a 10-minute ride, and to Mammoth Yosemite Airport, a 15-minute ride. During the winter, ski rentals are available on site, and in the warm months, fun at Devils Postpile National Monument is a 30-minute drive. The Village Lodge. The Village Lodge places guests in the center of Mammoth Lakes, just a 15-minute ride on the free hotel shuttle from Mammoth Yosemite Airport. A 5-minute stroll takes visitors to the town’s restaurants and shops, and access to the ski slopes and trails is as simple as hopping on a gondola. Mammoth Estates Rentals. Situated in Mammoth Lakes, this condo is within 2 mi (3 km) of Sierra Star Golf Course, Mammoth Hospital, and Mammoth Lakes Welcome Center. Edison Theater and Mammoth Ski Museum are also within 3 mi (5 km). What are the best deals on 4-Star Hotels in Mammoth Lakes? Mammoth Lakes is full of hotels and it can be hard to narrow down where you really want to stay. Luckily, we've done that hard work for you be narrowing you from 688 hotels throughout Mammoth Lakes, to the 29 4-star hotels in Mammoth Lakes. Our 4-star hotels in Mammoth Lakes are exactly what you need for your next family trip, romantic weekend, or solo getaway. Check out our most popular deals below. The Westin Monache Resort- Mammoth: This Mammoth Lakes resort is adjacent to The Village at Mammoth and a mile from the Mammoth Luxury Outlets. Mammoth Mountain Ski Resort is 2.7 miles away. Chateau De Montagne 26: This Mammoth Lakes resort runs a free shuttle service to Mammoth Mountain Ski Area, a 10-minute ride, and to Mammoth Yosemite Airport, a 15-minute ride. During the winter, ski rentals are available on site, and in the warm months, fun at Devils Postpile National Monument is a 30-minute drive. Timbers 1033: This Mammoth Lakes resort runs a free shuttle service to Mammoth Mountain Ski Area, a 10-minute ride, and to Mammoth Yosemite Airport, a 15-minute ride. During the winter, ski rentals are available on site, and in the warm months, fun at Devils Postpile National Monument is a 30-minute drive. Chamonix 88: This Mammoth Lakes resort runs a free shuttle service to Mammoth Mountain Ski Area, a 10-minute ride, and to Mammoth Yosemite Airport, a 15-minute ride. During the winter, ski rentals are available on site, and in the warm months, fun at Devils Postpile National Monument is a 30-minute drive. What are the most popular attractions in Mammoth Lakes? People travel to Mammoth Lakes from all around to witness the incredible sights and attractions. With 47 sights to see during your stay, you're sure to have a busy trip in Mammoth Lakes. Below, we've listed some of our favorites. Run down old motel. Rooms are decent size but lacking any meaningful maintenance. Our room had beat up furniture oddly painted walls huge patches to the ceiling left untextured. Bathroom was just a step above discussing. Excellent and comfortable. It is not clear on the additional fee one has to pay when you arrive. Perfect hotel in the heart of Mammoth Lakes. Extremely comfortable rooms and beds. I liked the bfast spread as well. Nice motel on our way through, just for sleeping this was sufficient. No breakfast, however on the road there was sufficient possibilities to buy breakfast. Staff friendly.